No, the last few years have taken their toll on me. Something about those Paranormal Activity movies works very well for me, meaning they scare the bejesus out of me. Part 2 in particular had some scenes that had me shaking and trembling like no grown man should. I was secretly glad they screwed up a little with the third one – gave me a little out, a chance to mentally crack the hold those movies held over my psyche. This year I’m taking it easy, enjoying lighter fare. The season should be enjoyable right? I took a chance with Cabin In The Woods. Actually, I had been wanting to watch this one for so long nothing was going to stop me once I saw Netflix had it available on DVD. The only chance I was taking was that it would scare the pants off me and dash my plans for a light horror season. IF YOU HAVE NOT SEEN CABIN IN THE WOODS YET READ NO FURTHER. I won’t warn you again.This is not a review of Cabin In The Woods designed to get you to see it. This is for those who have already seen it (or, I suppose, those who have no intentions of ever seeing it but for some reason want to read about it anyway). The following will be nothing but spoilers. Luckily enough for me, Cabin In The Woods is a perfect movie for how I’m feeling this autumn. It’s got that supernatural horror element going on, but it’s actually not really scary at all – often it’s very funny. The concept of manufacturing a teenage-slaughterfest-in-the-woods scenario as part of an ancient ritual to appease ancient blood hungry gods, all controlled with modern big brother technology, is world-mashing at its best. Genre-wise, I must admit I struggle to even consider this a horror movie at all. The elements are all there, and I mean all there, but the tone was so light and funny throughout I feel this really is just black comedy farce. I can’t really recall a truly scary scene – some were a little suspenseful, yes, but nothing truly psychologically terrifying. Meanwhile, consider the distinction drawn (out of the necessity of settling bets amongst the office workers no less!) between ‘Zombies’ and ‘Pain-loving redneck zombie family’, and the analogy made to the difference between the two being akin to the different species Sea Lion and Lion! Truthfully I may have slightly misquoted the film, I don’t remember, but it doesn’t really matter – this is hilarious stuff. And who can ever forget the guy who gets pissed because he never gets to see the mer-man? After the beasts are released and everyone starts to die, how does he get his? The mer-man! I love it! He says so greatly: “Oh come on!” or some such words to that effect. The irony is delicious. Actual elements of the film were seriously flawed, all fun aside. One big problem for me was that big red button that released all beasts… WTF? Before even getting to our survivors accessing this room, yet alone this button (and there are problems there too, rest assured!) why does this button exist? Who the hell built this feature into the system and why did they do it? Total Deus ex machina cop out. But it wasn’t as if the movie was so serious before, so I won’t spoil all the fun. What I really did appreciate was how this film really made me question the whole “good guy bad guy” concept. Especially once we realize the fate of the world depends on these youngsters dying, you really have to wonder who to root for in all the mayhem. To root for their survival is to root for the death of everyone. But to want to see them die seems a little off from the usual sentiment. Then there’s the idea, expressed so well by the stoner character, that maybe it’s time to call it quits anyway – the idea that the world is broken beyond repair. A bleak concept, to be sure, and one that, despite the mechanical logic of lining up with the survival of the characters, doesn’t really mesh well emotionally with them surviving. If the world’s so screwed up, to hell with you two too! LOL It’s a twisted mess of an idea after a while, trying to decide for myself how would I really like this to end. Luckily enough, it wasn’t up to me; all I had to do was keep watching! 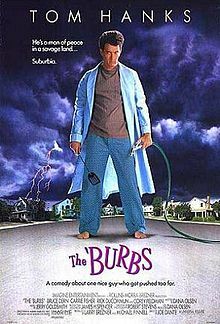 Now, for a blast from the past: The ‘Burbs. Anyone remember this one? For some reason no one talks about this movie anymore. This was one of my favorite movies of all time when I was eight or nine years old. It had such a subliminal effect on me that I once bought pretzels and sardines just to see what they tasted like together. And on the DVD I bought several years ago but never watched until this weekend, there’s even an alternate ending which is also very good. So, am I alone in thinking this is a highly underrated movie that time has nearly forgotten or what? There was a lovely black and white movie (1950’s?) which had no extreme special effects. There was sound, but no overt display of what exactly we’re supposed to be frightened of. It was just noise coming from the ceiling and walls, but it was something that we couldn’t see. I remember watching it last October, but for the life of me, I can’t remember the title. Spectacular watching for this time of year. Yeah, that doesn’t leave a lot to work with… Sounds spooky though 🙂 If you can recall anything else let’s have it. I’m always up for some good old fashion scares! It’s called The Haunting and it came out in 1963. If I had one word to describe it, I’d call it “charming”. May seem odd to call a horror movie that, but those days, they really managed to pull it off. I remember it even more because that night I was really running late and almost didn’t make it to the grocery store to buy coffee. It was cold, windy, and I was dead tired so I just made myself a cup and landed on the sofa for some TV. I think it was on TCM (Turner Classic Movies) at the time and it was the perfect movie to end a day like that. Well worth your time. Yeah, it was remade a couple of times, I think, but these didn’t carry the same subtle impact. The one with Catherine Zeta Jones and Liam Neeson was quite bad. Not bad as in “good”, but just “bad”. Skipped reading a cabin in the woods as you suggested…well i did read a little of it anyway. Don’t remember Tom Hanks in the Burbs at all, and I like Tom Hanks, I think I’ll rent the movie and watch it when I have some down time. Have a good day Steve. It’s a great film I think. Good for fall, light fare as I call it! Enjoy your day as well. Just watched The Haunting. Excellent old film. Good “light fare” as I call it – spooky, but nothing to induce nightmares… Unlike that Paranormal Activity series, which I just saw has a fourth installment arriving shortly. God help us all!